There are pairs of blades at either side of the front end, situated below the headlights and painted orange on our car. 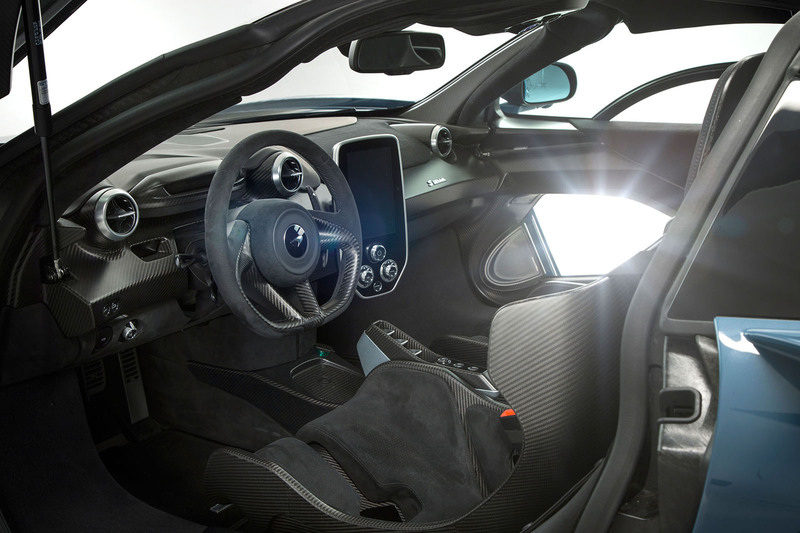 “We’ve decluttered the interior, putting controls such as window switches, lights and door handles into the overhead console"
You have to admire McLaren Automotive’s chutzpah. For a business not yet a decade old to risk naming its latest car after Formula 1 legend Ayrton Senna requires huge confidence in your product. The name, bestowed upon the £750,000 supercar seen here - in exclusive Autocar pictures - ahead of its public unveiling at next month’s Geneva motor show, is definitive. If you give your car such a highfalutin name, it jolly well had better live up the hype: you won’t get a second chance. And, well, here it is, all unsubtle sharp edges, wings, vanes and purposeful aggression. A road-legal track car that “can be driven to the shops”, as vehicle line chief Andy Palmer puts it. The Senna is significant for being the first McLaren Automotive production car (500 examples to be made from the autumn, all sold) to be given a proper, emotive name, as opposed to a combination of letters and numbers. McLaren received the blessing of Viviane Senna, the grand prix ace’s sister, to use the family name. Her son, experienced racer Bruno, is a McLaren ambassador and was involved with testing and development. But why is now the time to deploy a name so heavy with meaning and expectation on a track-focused supercar? “We have talked in the past with Viviane and Bruno about doing a collaboration, but we never wanted to simply do a ‘Senna’ variant [of an existing model] or to stick the name on something just for the sake of it. It had to be something that felt credible and appropriate,” says chief executive Mike Flewitt. 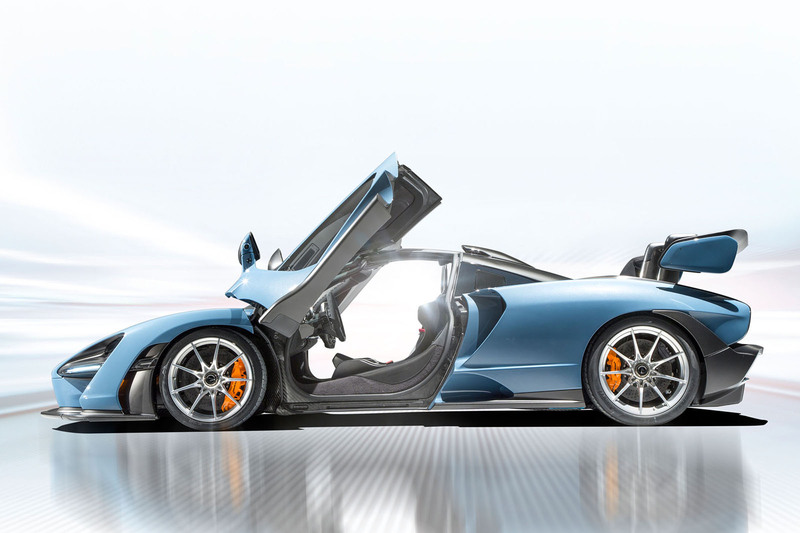 “This car was designed to be phenomenal on track, so it seems like a product that is unique, focused and special enough to reflect Ayrton.” Although it shares attributes with the 720S, the Senna sits above that car in McLaren’s model hierarchy, taking a place in the most exclusive Ultimate Series stratum inhabited by the P1 hybrid hypercar, by dint of its price, rarity and heady performance. The Senna looks every bit as uncompromising as the icon that it is named in honour of. Would he have approved of the car? If he knew it would offer him an advantage over his on-track rivals, most probably. The Senna has sufficient stowage space for two crash helmets, race suits and pairs of boots… and that’s it. The P1 had a similar amount of space under its bonnet, but on the Senna, that area is taken up by a centrally mounted radiator, so the stowage is directly behind the two seats. The car is bereft of creature comforts, although luxuries such as air-con and an audio system are on the options list. Once the engineers had finished stripping away every extraneous gram of weight, they were challenged to find an additional 5% weight saving throughout the car. To achieve that, they zeroed in on the minutiae. For example, a change of the type of bolt used throughout the car yielded a 33% weight saving per bolt. 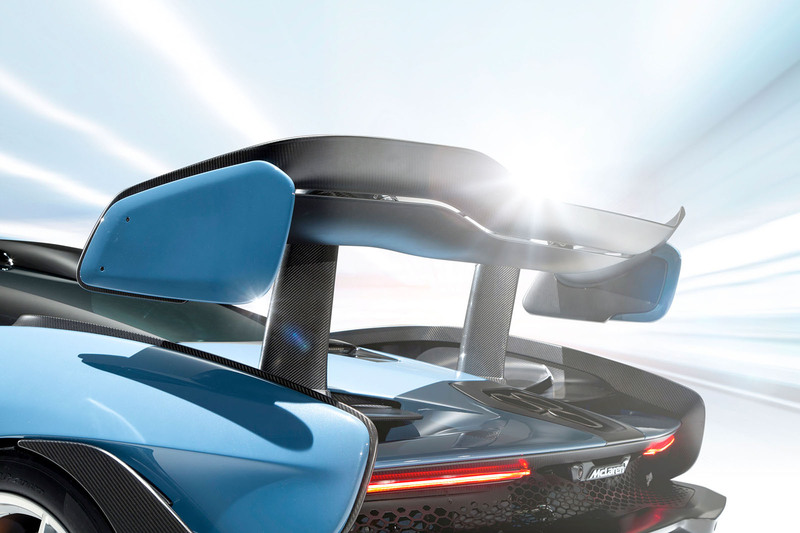 The mechanical door release used in the 720S was replaced by an electrical system that is 20% lighter. Even a special paint colour that needs to be applied less liberally than standard paints was developed. The result? A dry weight of 1198kg (see Monocoque). The Senna can generate 800kg of downforce and uses active aerodynamics to help manipulate that vertical force. There are pairs of blades at either side of the front end, situated below the headlights and painted orange on our car. The lower paid of blades adjusts to maintain an optimal aero balance, working in conjunction with an active rear wing. Director of engineering design Dan Parry-Williams says: “With so much downforce being generated, there’s a lot of aerodynamic balance shift under braking. We want to avoid all of that aerodynamic force transferring to the front wheels and making the rear unstable. By reducing the angle of the front flaps and increasing the angle on the rear wing, we can shift the aerodynamic balance rearwards to increase stability, which means you can brake harder.” The imposing rear wing, attached to the car via ‘swan neck’ pylons, weighs 4.87kg and can support more than 100 times its own weight in downforce. The Senna generates its maximum downforce at 155mph, but above that speed – the car tops out at 211mph – the wings adjust to bleed off unneeded downforce. The Senna is based around Monocage III, the latest, lightest and stiffest iteration of the carbonfibre chassis that the manufacturer has yet made. 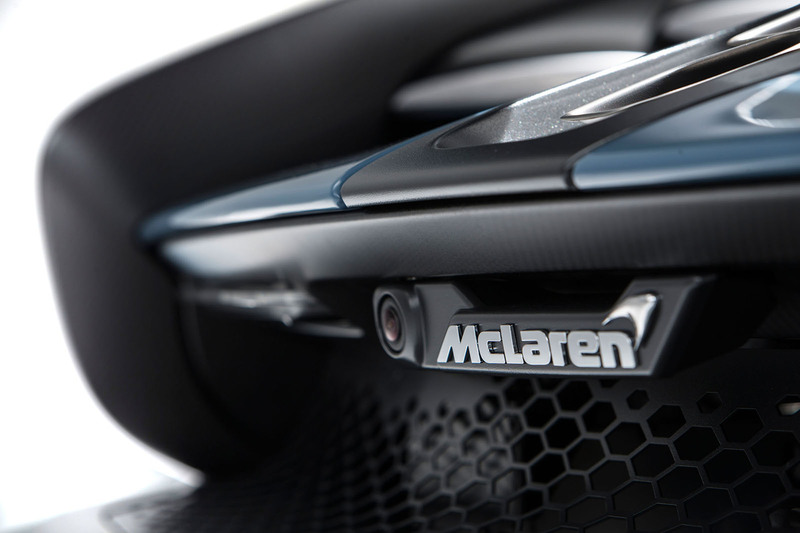 Together with carbonfibre body panels that weigh 60kg in total, the Monocage contributes to the dry weight of 1198kg, which eclipses that of every McLaren road car besides the 1138kg F1. The powertrain and suspension components are mounted on aluminium subframes, and a carbonfibre crash structure integrated into the rear bulkhead means there isn’t a need for an additional rollcage to be installed for track driving. The doors each weigh 9.88kg, roughly half the weight of those on the 720S, and many of the aerodynamic features that are so critical for the car’s performance are moulded into the carbonfibre design. The doors also incorporate a half-drop window section, similar to those on the McLaren F1, where only part of the glass opens. This has myriad benefits: the door skin can be thinner, so airflow around the body is improved, and a smaller electric motor can be used to wind the half-drop window, saving weight and improving packaging. There’s also an optional see-through panel in the lower portion of the door. “We removed all of the weight that is in a typical side window system and then, because there is nothing obscuring the lower part of the door, we were able to put the lower glazing in,” says design director Robert Melville. “The focus is solely on the driver’s ability to do an incredibly quick lap time,” says Andy Palmer, vehicle line chief for Ultimate Series cars, about the spartan interior. “We’ve decluttered the interior, putting controls such as window switches, lights and door handles into the overhead console, where they are accessible but aren’t going to distract from the sole purpose.” Also located in the roof is the button to engage full-bore Race mode, although the three standard driving modes – Comfort, Sport and Track – are engaged via a switch on the centre console. The three buttons that select drive, neutral or reverse from the transmission are on a console that’s bolted to the side of the seat and moves with it, so it is always in the optimum position for the driver. The exposed gas strut that props open the dihedral door is unusually prominent. It has been positioned so that it requires as little effort as possible to support the door, so a lighter strut can be used to save weight. 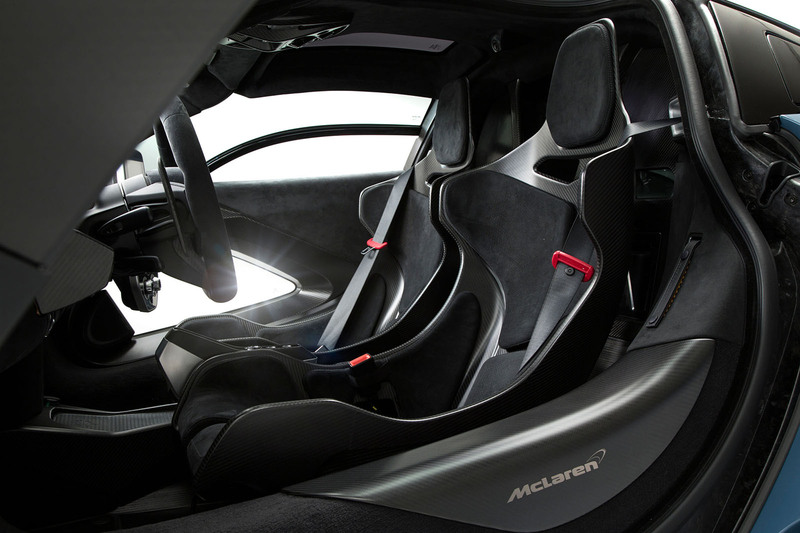 Weighing 8kg, the carbonfibre seat is the lightest yet produced by McLaren. Rather than clad the entire 3.3kg seat shell in padding, to save weight the engineers carried out pressure mapping to work out where the contact points between body and seat are, and then padded only those sections with Alcantara. Further structural analysis enabled the development team to determine where they could cut out unneeded sections of seat shell to further reduce weight. Woking’s staple mid-mounted twin-turbocharged 4.0-litre V8 remains, albeit with a host of detail changes and lighter components fitted to ensure it generates more power than in any other McLaren. 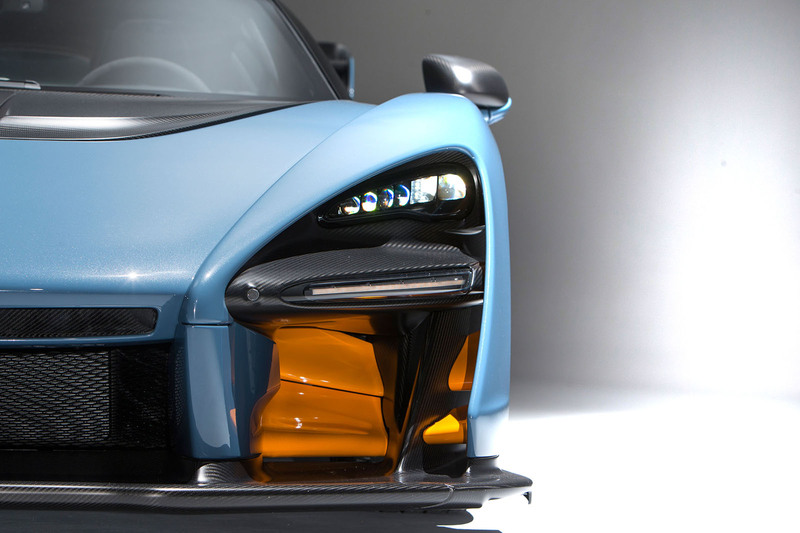 Peaks of 789bhp and 590lb ft represent gains of 62bhp and 59lb ft over the internal-combustion engine in the P1. Of course, the P1 can call upon additional poke from its electric motors, giving it 903bhp and 723lb ft, but it also has to lug around a battery pack and those motors. 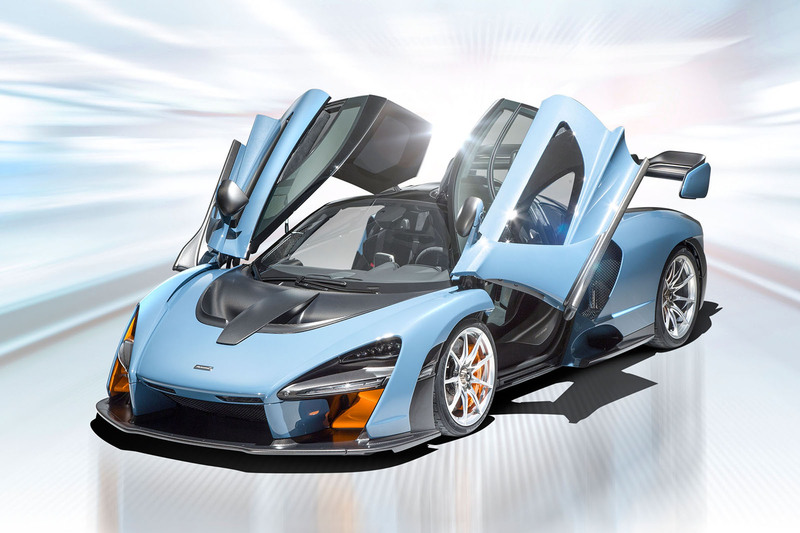 McLaren puts the Senna’s power-to-weight ratio at 659bhp per tonne. A seven-speed dual-clutch transmission drives to the rear axle, firing the car from standstill to 62mph in 2.8sec, matching the official claim for the P1. 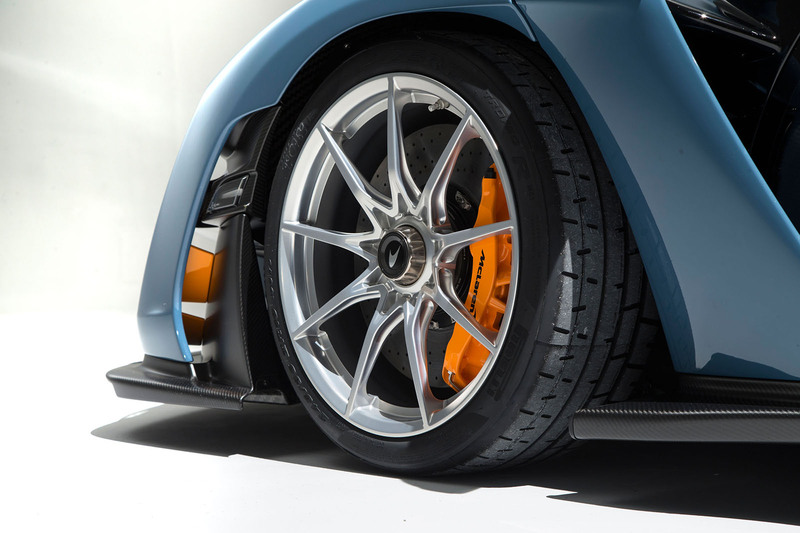 The Senna is the “most responsive McLaren yet”, according to Andy Palmer, and one of the keys to its handling prowess is a new adaptive suspension system developed from the P1’s all-independent double-wishbone layout, with specially tuned dampers that are hydraulically interconnected (both front to rear and side to side), plus another hydraulic system that functions as an anti-roll bar. The entire set-up is governed by a system called RaceActive Chassis Control II (RCC II) that incorporates an automatic stiffness control called K-damper. When Race mode is engaged, the Senna’s ride height is lowered by 39mm at the front and 30mm at the rear and the roll stiffness is increased, improving downforce and lateral grip. Is McLaren readying the Senna for Le Mans? Its amazing what they are turning out, so confident they can turn out something ugly but functional like this. Only 10 years old they are killing Ferrari if you measure by output of new product (Ferrari a brilliant company in their own right). Although nothing to match the Superfast yet. Utterly amazing but will kids have the poster on their bedroom wall? No. Not a chance. It's utterly hideous to look at. Not based on any evidence at all, but i think you might be wrong. Its definitely not classically pretty, but its certainly purposeful and looks 'fast'. In the same way kids like music that older people cannot stand or fathom, this might be appealing to those that dont yet have preconceived ideas of what a 'good looking' supercar looks like. Tested independently the LaFerrari was slower than the P1 and in some cases the 918. Unfortunately this is not the case. Multiple reviews have given a clear verdict, i.e. the Ferrari was the best road/track car compromise. And - tested independently - LaFerrari was faster than the P1. Check several reviews done by Grand Tour and Top Gear, for example. But not only. Actually the P1 was the scariest thing to drive amongst the "holy trinity". "Which means we finish with an unexpected result: a single, unanimous winner. To be honest, there was no particular order to the other two, the arguments about the 918 and P1 settling into a comfortable cyclical argument about ferocity versus technology. And yes, as CT says, they are all so fast that you might as well pick the car that you prefer the look, or the brand image, of – you won’t exactly be left standing in any kind of race. But on these two days, through all these conditions and on these roads, there is one car that TG magazine would most like to take home. LaFerrari wins." I don’t find this ugly or beautiful, just effective. The more you optimize a car for the track the worse it becomes for the road and the less likely it is to be beautiful. When was the last time you saw something beautiful on the grid of a formula one race that wasn’t a grid girl? Menace Looking , rare and functional. Brilliant stuff from Mclaren for such a young car company. As a very regular track day participant, I really hope McLaren provide their own private days for these cars , because I really don’t fancy being on track with a car that has such a massively large speed differential to myself , potentiallly driven by an testosterone rich “city boy”, who “always wins “, but is too busy at work to develope any track driving skills . There comes a point where ( and I never thought I’d say this ) manufacturers could be regarded as irresponsible for offering cars with such performance where the only customer selection process is money . Just to add to the argument, I also think it is hideous . Seen a few 720S models at track days, do McLaren have a problem with the fit of the front bonnet ?